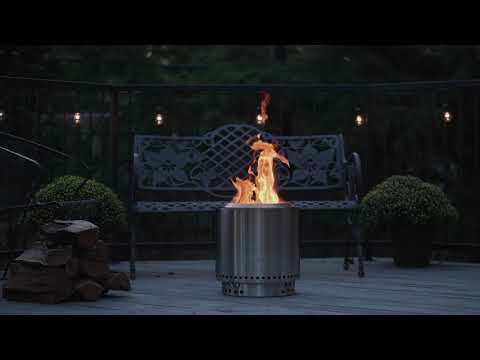 The Ranger Fire Pit by Solo Stove is the most compact fire pit in the Solo Stove collection. The Ranger features a patented air flow design that is unmatched by any other fire pit. This technology helps logs burn completely and greatly minimizes smoke. Solo Stove puts air intake holes on the bottom of the fire pits that pull air in towards the fuel source. While this air is being pulled in, the double-wall construction allows the air to be heated up and fed through the top vents. This provides an extra boost of pre-heated oxygen, creating a secondary combustion and an attractive flame that everyone will enjoy. The Ranger is perfect for smaller spaces, city dwellers and especially well-suited for those who live life on the go. The Solo Stove Ranger harnesses Solo Stove's patented design in a more compact and travel friendly size when compared to others in the Solo Stove fire pit collection. The Ranger is highly portable, and with a quick set up and start time, allows you to have a no-trace fire in more places than just the backyard. The intelligent double wall design creates a burst of hot air over the fire, effectively reducing the smoke without the use of batteries and fans. By design, the Solo Stove Ranger burns wood so efficiently, the only thing that will be left is ultra-fine ash. This makes cleaning as simple as dumping out the ash. The fire pit can be easily fueled by chunk wood or small logs. The Ranger offers all the benefits of a wood-burning fire without the smoke or the campfire smell sticking to your clothes. This fire pit also includes a durable carrying case with handles for easy storage and transport. Solo Stove warrants each and every Solo Stove product to be free of manufacturing defects, and will repair or replace with a new product, at their option, any Solo Stove product that is deemed defective. Solo Stove offers a lifetime warranty with proof of purchase.